Papers: 1864, 1866. 2 letters. Papers: 1839-1899. 1 container; ca. 300 items. Chiefly letters received relating to Pennsylvania and national politics, 9 letters by Buckalew, daybook (1844-1869), financial papers, and Mrs. Buckalew's diary (1859) during her stay in Ecuador while her husband was U.S. minister. Papers: 4 letters (1859-1861, 1868) in various collections. Papers: 1856-1875. Ca. 100 items. Legal and political papers relating to his law practice and activities as U.S. and state senator. Finding aid. Buckalew, Charles Rollin. An Examination of the Constitution of Pennsylvania. Philadelphia: Kay Brother, 1883. ___. Proportional Representation. Edited by John Grosse Freeze. Philadelphia: John Campbell Son, 1872. Hummel, William Willits. 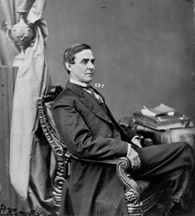 "Charles R. Buckalew: Democratic Statesman in a Republican Era." Ph.D. dissertation, University of Pittsburgh, 1963.